The Crusaders love the opportunity to review new places – not only do we get to eat cupcakes, but we also get to visit new shops! 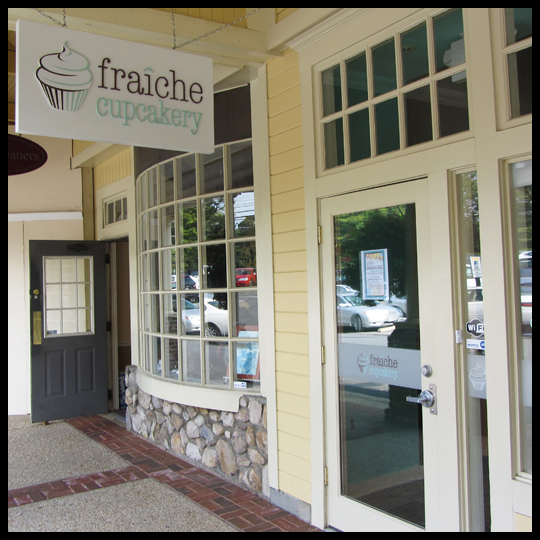 Recently, we all trekked to Bethesda, MD to Fraîche Cupcakery to spend some time together and taste some cupcakes. 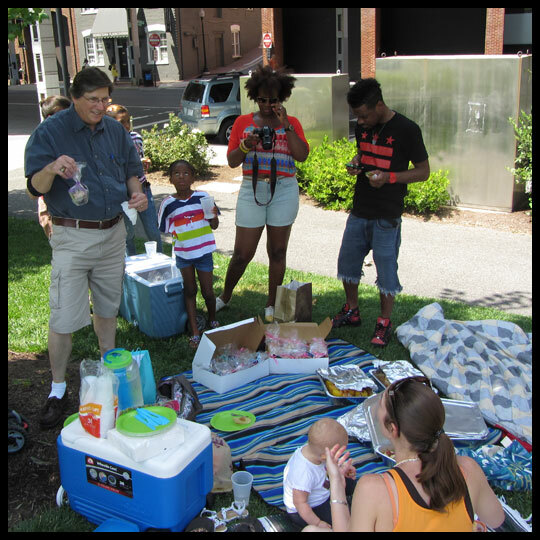 We even had a chance to meet our friend Joel, from Josie’s Confections. Thanks for meeting up with us Joel! 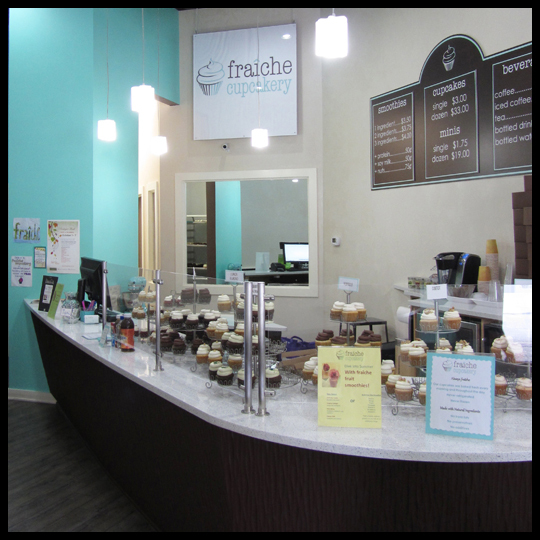 Fraîche Cupcakery (“fresh” in French – for those who don’t know) has been on our “to try” list for quite a while, and we love their dedication to being all natural and eco-friendly. Using all-natural and local ingredients, as well as recycled materials in their shop and display signs and packaging, already scores points with the Crusaders, as we all three try to watch our environmental impact. 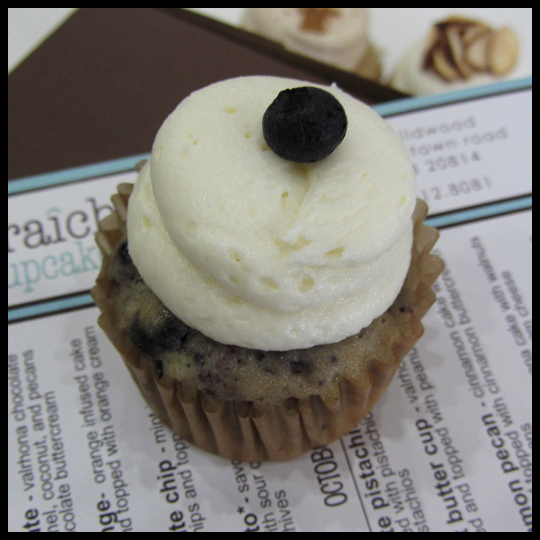 Interesting flavor combos always intrigue and inspire us, so we knew we had to try this cupcake. When Crusader Jenn and I initially tasted the frosting we liked its punch of tea flavor, but then tasting it with the cake made us all look at each other quizzically. We just didn’t like the two flavors together. The cake flavor itself was ok, but the texture was off and reminded us of a cake/brownie mix. The frosting alone tasted exactly like green tea, but had a very sweet aftertaste that I didn’t care for. 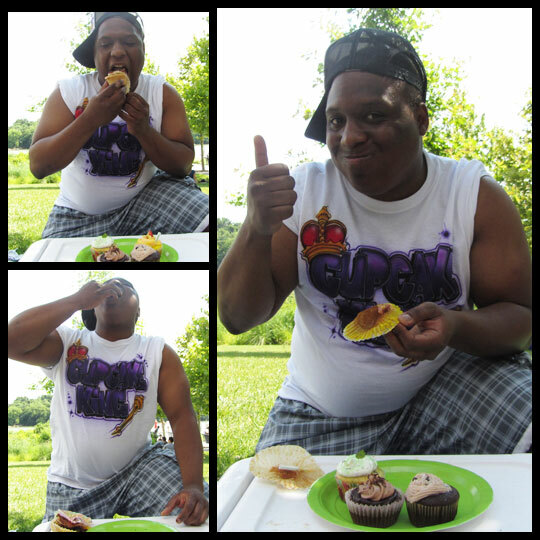 Joel also didn’t like this flavor combination, and didn’t finish this cupcake. 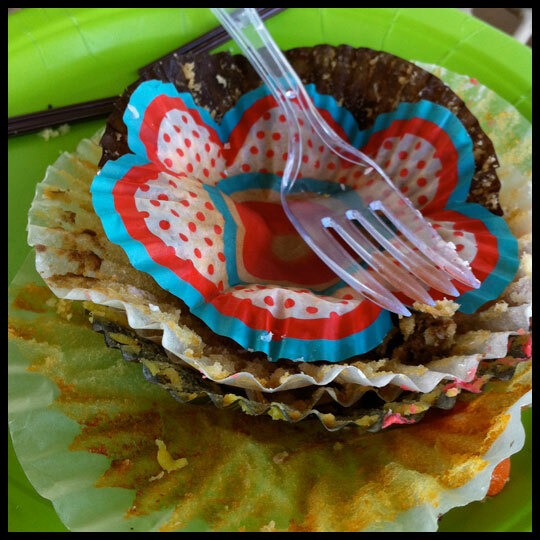 While this might not have been our favorite cupcake, it did spark discussion of what kind of flavors might work better and might have inspired my next baking experiment flavor! 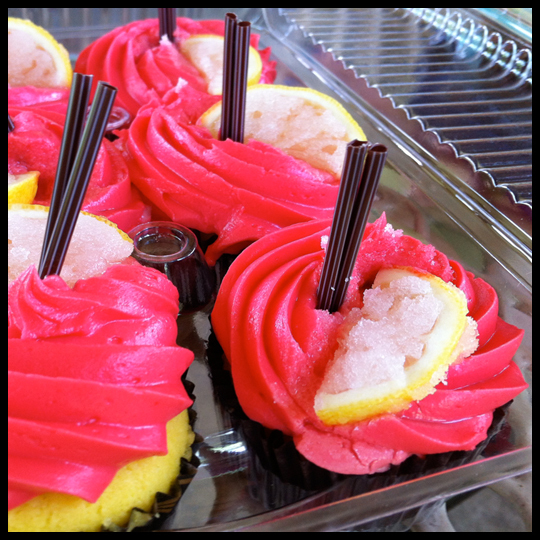 Being the “Red Velvet Crusader” I am very particular, but this cupcake did not disappoint. 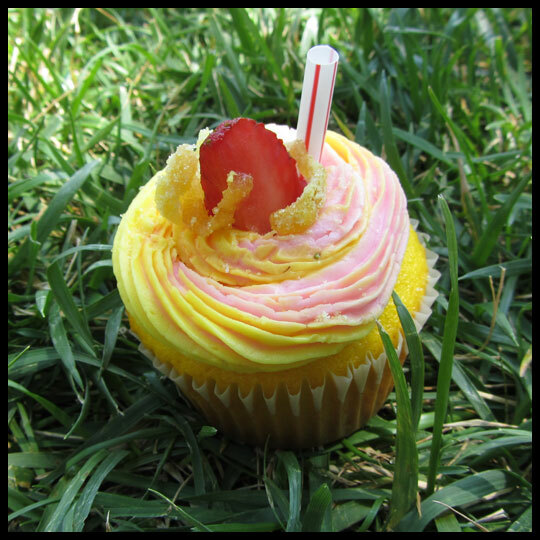 Cake with a crunchy top isn’t always a good thing, but it was one of the many reasons I loved this cupcake. The cake had amazing flavor and the frosting was smooth with a well balanced cream cheese frosting. Crusader Stacy and I really enjoyed this mini and next time I’ll need to order a full-size Red Velvet. Cinn-fully delicious! Wow, did this cupcake pack a cinnamon flavor explosion. We all enjoyed the generous dusting of cinnamon on top. 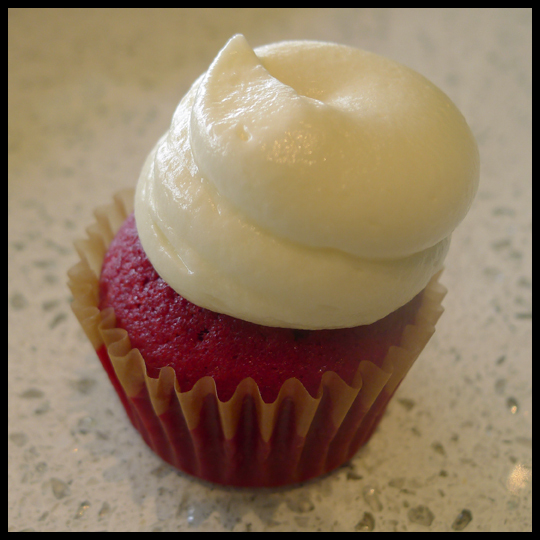 And with the perfect sweet, moist cake and creamy frosting balance, this cupcake was a great fall treat. 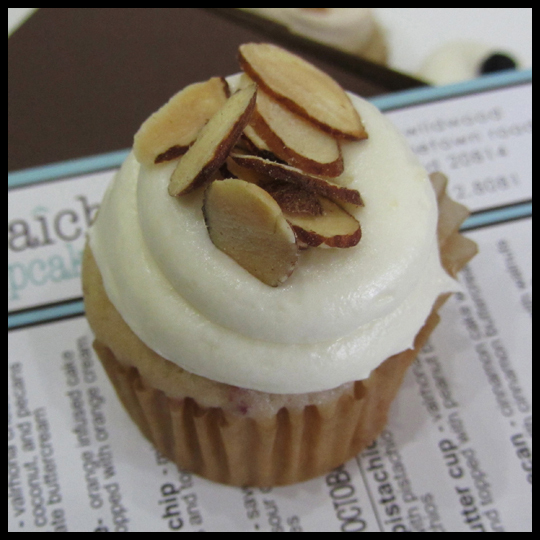 Almond is a favorite flavor profile of the Crusaders and this cupcake was the perfect balance of tangy raspberry and almond flavors. 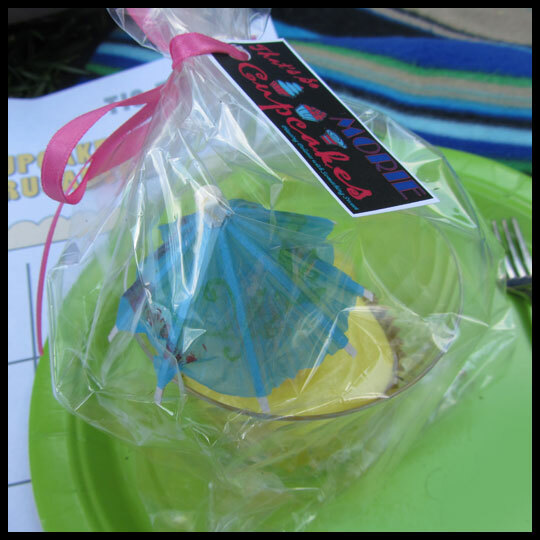 The cake was on the dense side, but that didn’t bother us as we dove in and devoured this mini. The frosting wasn’t too sweet and the sliced almonds on top added a fantastic crunch of texture. Jenn took this one home and enjoyed it, here are her thoughts: This cupcake had tons of coffee/espresso flavor in the frosting, but the cake had the same weird texture as the Chocolate Green Tea cupcake. Joel picked a couple of flavors that we didn’t try, including Lemon Almond and Carrot Cake. He agreed that the cakes were dense and a bit too dry for his liking. He also thought the carrot cake tasted more like a plain yellow cake with carrots in it, missing the spices that are typical for carrot cake flavor. 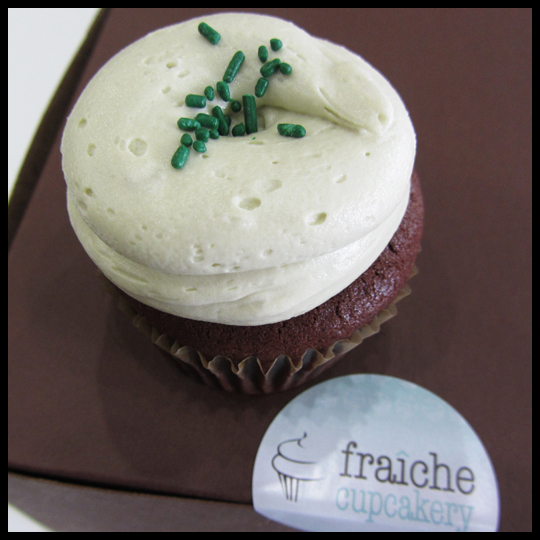 Overall we enjoyed Fraîche Cupcakery’s cupcakes, and while the Green Tea cupcake wasn’t a favorite, it did inspire flavor discussions and baking ideas. All of the cake was on the dense side, but that didn’t take away from their fantastic flavors. Their friendly staff, great flavor options, and dedication to the environment will keep us coming back when we are in the Bethesda area. The Weekly Savory Specials in October (available on Sat and Sun) include: Rosemary Fig (Oct 6-7), Baked Potato (Oct 13-14) and Chips & Salsa (Oct 20-21) and are all flavors that make us want to stop in on the upcoming weekends – oh if only we lived closer! 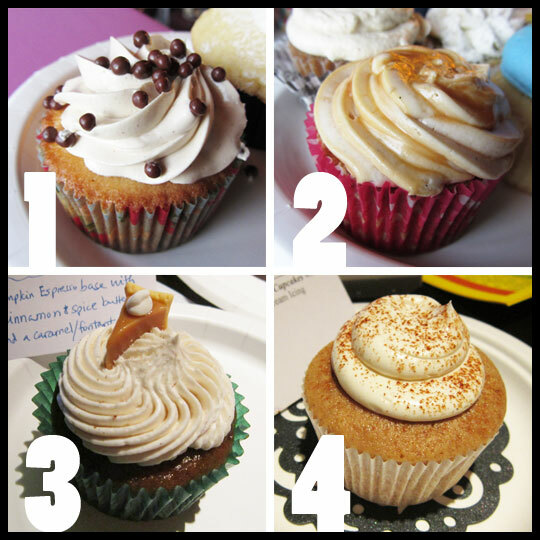 When CupcakeCamp DC posted that they had an opening for a fan judge, I jumped at the opportunity. Finally I could put all of my “practice” into use, and for a great cause. 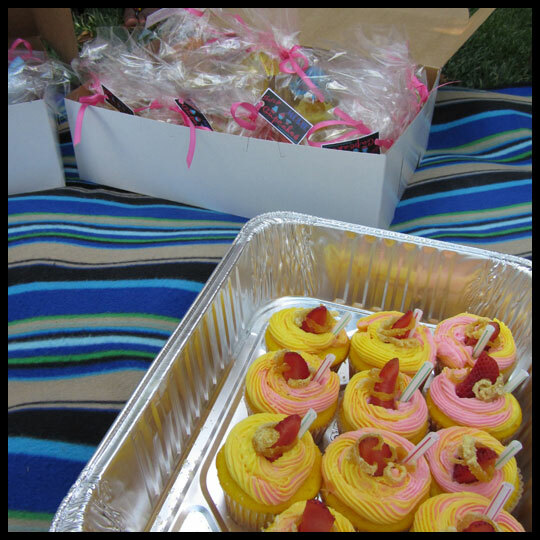 CupcakeCamp DC is in its third year and raises money for DC Candlelighters: Childhood Cancer Foundation. I’ve heard criticism about the past years, but being a new event organized by a single person, that’s expected. Each year changes have been made to make a better experience for all who participate. This year the event was held at the very chic Continental Modern Pool Lounge, located in Arlington, VA (but right over the bridge from Georgetown Park in DC). From a judge’s perspective, check-in was super easy. I saw that a line was forming, mostly due to the rain bringing in people from the Jazz Festival across the street, but was able to bypass it with my oh-so-important title. I checked in with a volunteer, who had the list on his phone and took my spot at the judges’ table. 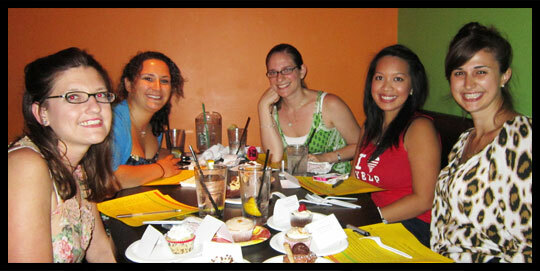 The other blogging judges arrived and then cupcakes started coming our way. 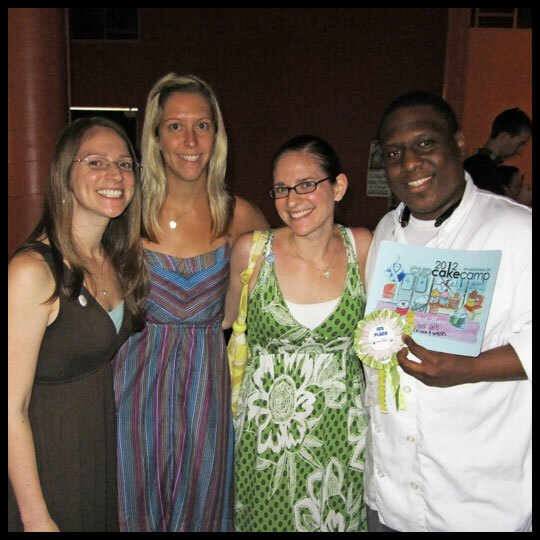 (Judges from left to right: Adrienne from Little Miss Cupcake, Jill from Cuisine Queen, me, Kimberly from Yelp NoVa, and Nikki from Cupcakes for Breakfast. Judging went fairly smoothly. 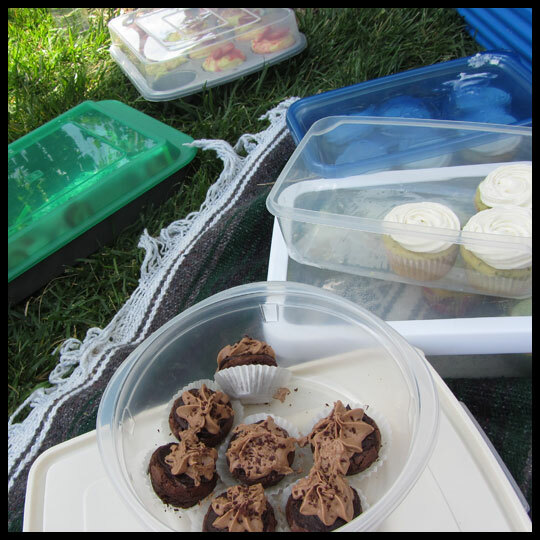 Cupcakes were brought to us, in no particular order. Finding them on our score sheet was fairly easy, unless a baker switched up their entry at the last minute. We asked for knives to divide the cupcakes among the judges, but there weren’t any available. Luckily none of us were germaphobes, so we decided that we would dig in and wipe off excess frosting and cake on our forks, instead of slobbering all over them. 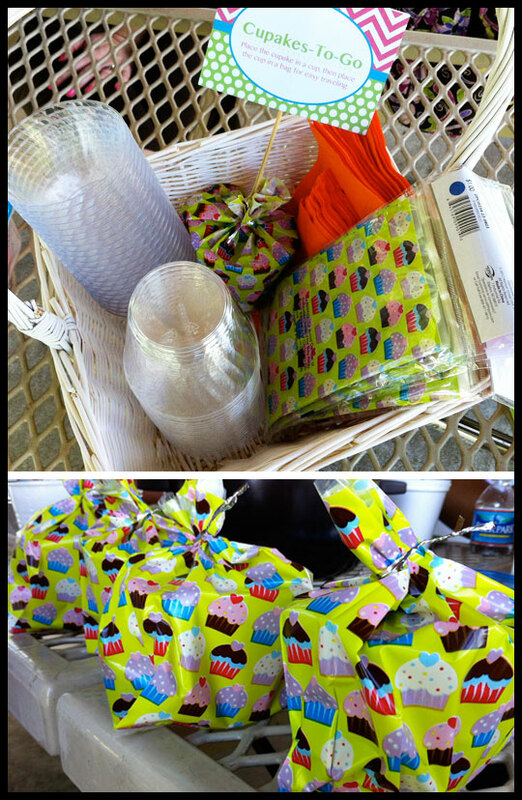 We had to request forks, napkins, water, and a trash bag. 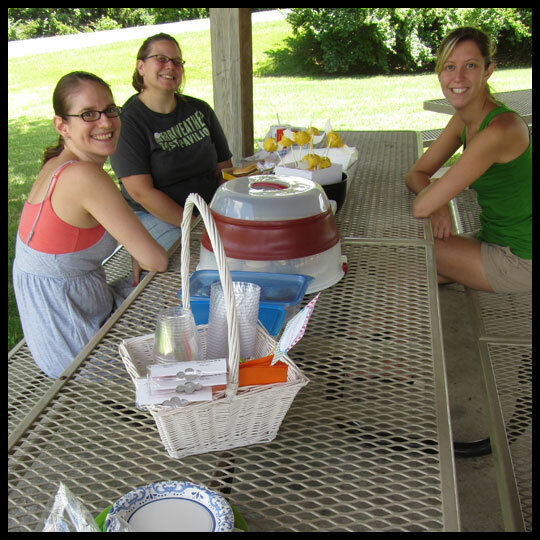 The volunteer, who was working hard and running around a lot to bring the cupcakes to us, didn’t look too thrilled with our requests…but how else could we taste the cupcakes? Other than that, the judges were treated well and, to show their appreciation, we all received event t-shirts and awesome swag bags, provided by Izze, one of the event sponsors. I asked Crusader Stacy for insight from an attendee’s perspective. She said that when they arrived there was a line and it seemed a bit disorganized, but that could have been due to the rain and people who hadn’t registered wanting to get in. 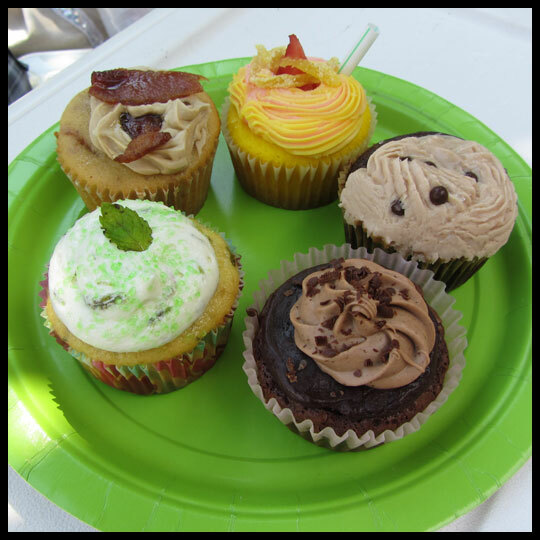 Lines also seem to form at these cupcake events because the guests are aware that it’s first come first served. Although the venue could be tight to navigate sometimes, it had a great ambiance. It seems like people enjoyed that you could order adult beverages and there were a lot of areas to lounge and indulge in cupcakes. The venue also offers game tables, like billiards, for added entertainment. Stacy mentioned that she and Crusader Elisa did not realize that the people’s choice ballot was in the brochure, and wished they had known. At the end of the event, it was hard to hear the winners (I think due to background sound…not much you can do about that) and it was a little confusing when announcing the winners was mixed in with the announcing the raffle prizes. 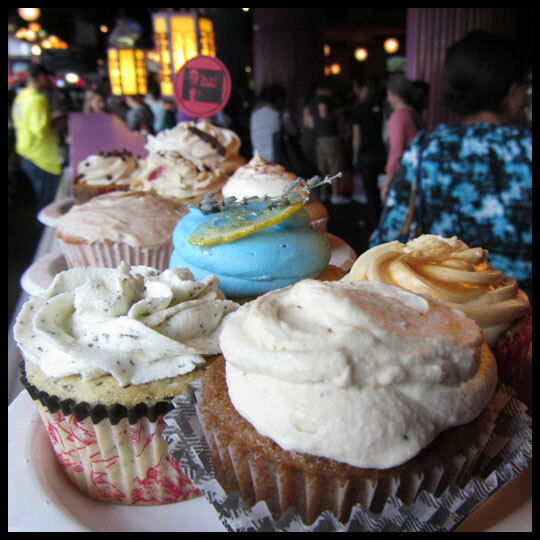 Luckily all the winners heard their names called, and we were all very excited that Joel Gill, from Josie’s Confections, took first place for his Chicken N Waffle Cupcake! 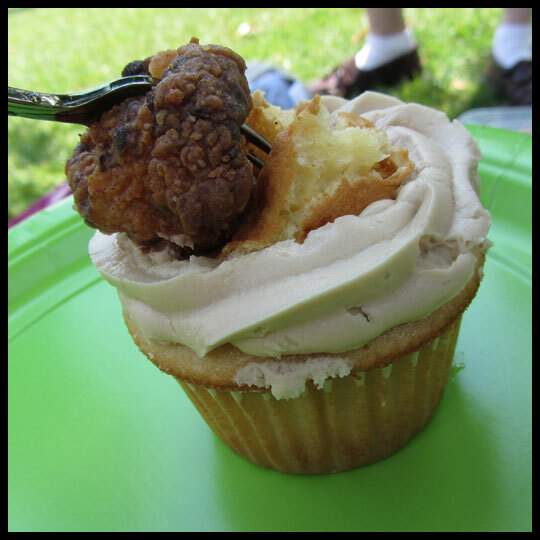 It’s no surprise that we adore Joel’s cupcake, having first had it at our 2012 DC Cupcake Picnic (see Crusaders’ review). 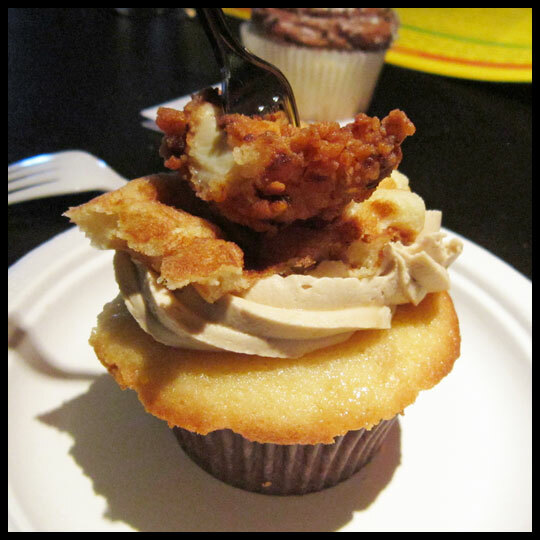 What did surprise me was that the other judges were very excited to try a Chicken N Waffle cupcake, especially when most people question this creation. I was relieved when they all agreed that it was the best they’d had all day. Stacy and Elisa both agreed that this was their favorite cupcake of the day. 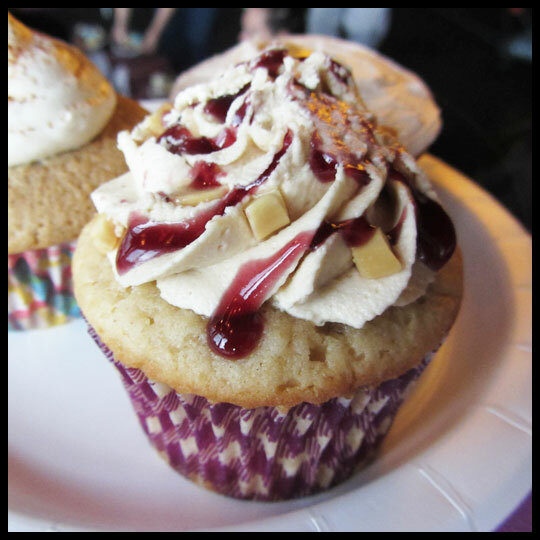 It had a peanut butter cake with grape jam filling, topped with peanut butter buttercream and grape coulis. They both love the nostalgia of PB&J cupcakes and thought the grape was a nice change from the strawberry jams most bakers use. 1. Megan Ferrey, from Cakes by Megan: Banana chocolate chip cake filled with chocolate ganache and topped with peanut butter frosting. 2. Monika Geraci, 2ND Place CupcakeCamp DC Winner & Crowd Favorite: Salted Caramel Apple – apple spice cake filled with salted caramel and topped with cream cheese frosting and a caramel drizzle. 5. Melissa Westervelt, from Honeybee Bakeshop: Pumpkin spice latte – pumpkin espresso cake topped with cinnamon and spiced buttercream and a caramel/fondant pumpkin pie decoration. 4. 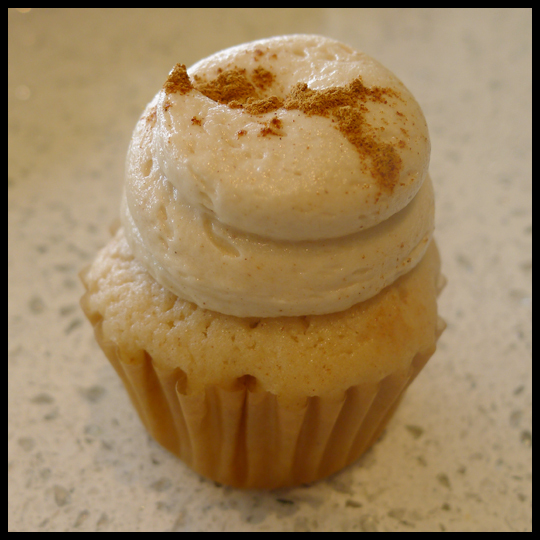 Claire Almquist: Chai tea latte cupcake with buttercream frosting. 1. Amanda Rouse 3RD Place CupcakeCamp DC Winner: Vanilla cupcake with Nutella ganache and Nutella buttercream topped with roasted hazelnuts. 2. Shelly Facemire, 4TH Place CupcakeCamp DC Winner & Crowd Favorite: Chocolate cake with peanut butter frosting and chocolate ganache. 3. Shanika, from Couture Cakes by Nika: Lemon lavender cupcake topped with lavender butter cream, candied lemon, and an edible lavender flower. 4. Valerie Estep, from Silver Swirl Cupcake: Salted Caramel & Chocolate – Butter yellow cake with salted caramel cream cheese frosting and topped with a chocolate covered pretzel. 5. Heather Jesness: Vanilla bean cupcake with chocolate frosting. 6. Megan Ferrey, from Cakes by Megan: Dark chocolate cherry filled cake with pistachio meringue buttercream. 7. 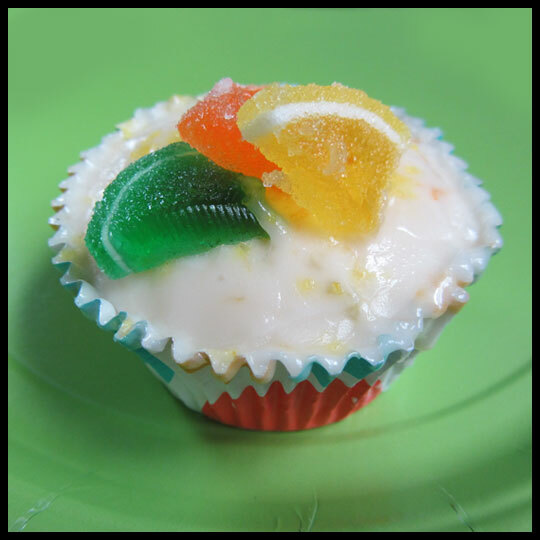 Kelly Zonderwyk: Lemon lavender cupcake with a glaze and filled with lemon curd. 8. Elisabeth Shankle: Banana cupcake with peanut butter frosting. 9. Shannon Paciorek: Key Lime Pie Cupcake – Graham cracker crust, lime infused cake filled with a lime curd, and lime cream cheese frosting. 10. 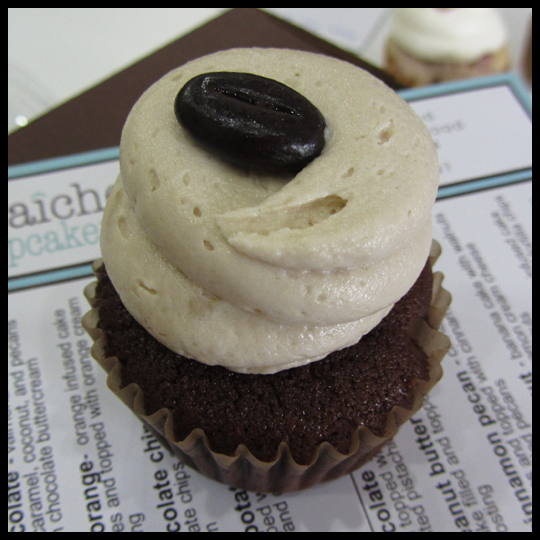 Paola Veronica: Mini mocha cupcake with espresso buttercream. 11. 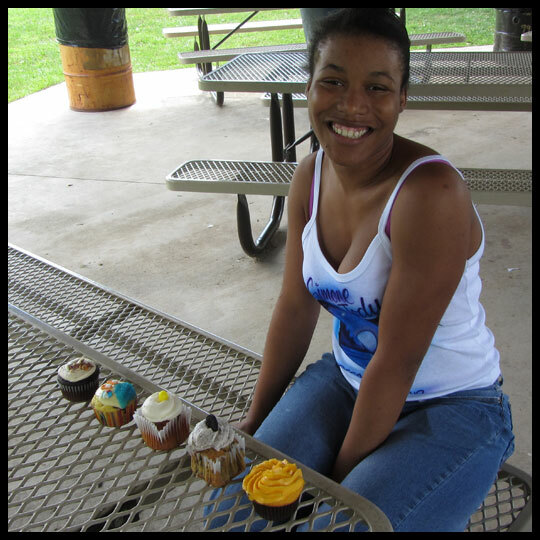 Chinwe Aldridge: Vanilla cupcake with cream cheese/buttercream frosting, graham crackers, white chocolate, candies, and shoe decoration. 12. Alicia Hadley: Red velvet cake with a walnut cream cheese frosting. 13. 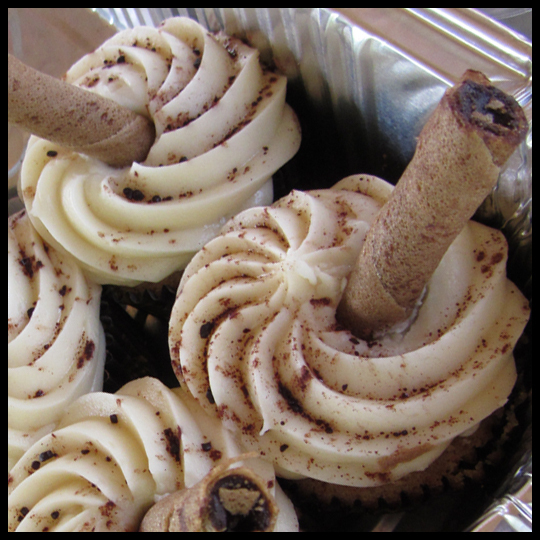 Katie Walker: Canoli Cupcake – Vanilla cupcake with orange zest, ricotta and chocolate chip filling, and vanilla buttercream frosting with chocolate garnish. 15. 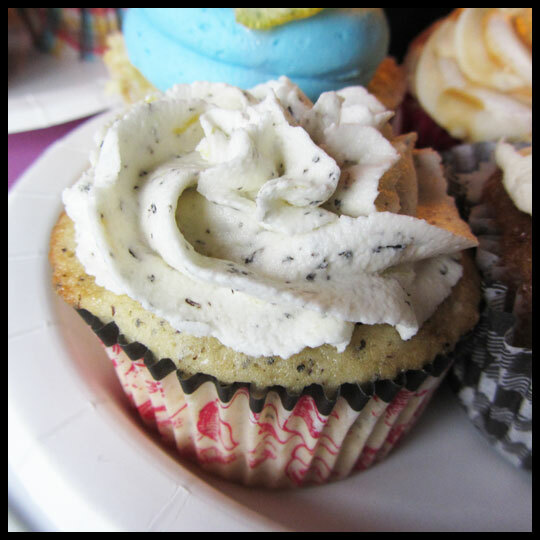 Jennifer Hlad: Hummingbird cupcake with coconut cream cheese frosting and toasted coconut. 16. 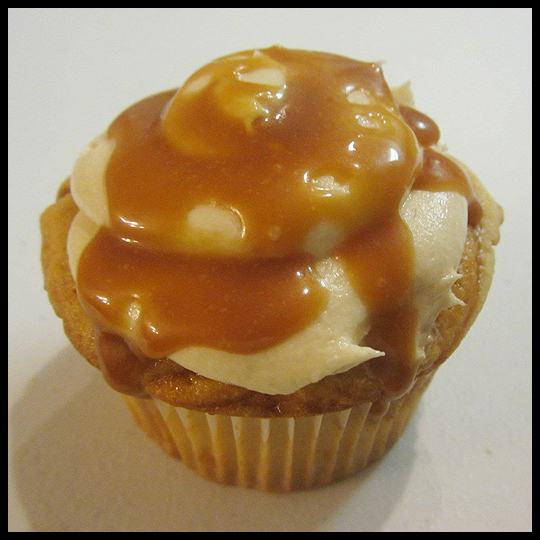 Meghan Ochs: Vanilla cupcake, with cinnamon apple compote, topped with cinnamon cream cheese frosting and a caramel drizzle. 17. Kathleen Mudge: Vanilla bean cupcake with chocolate fudge icing, topped with a brownie truffle and cookie. 18. 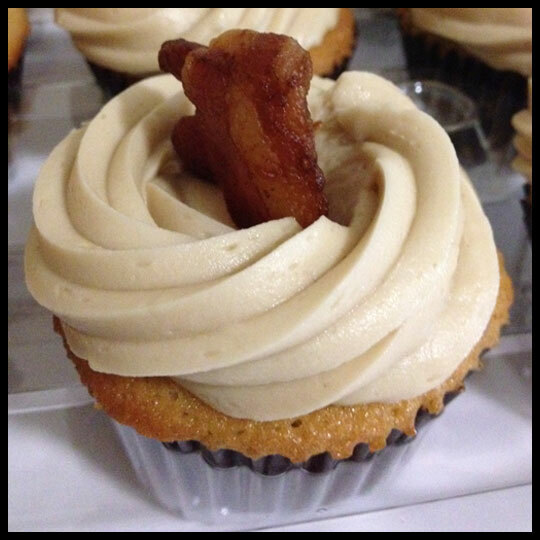 Michelle Byers: German chocolate cake with caramel buttercream topped with bacon. 19. 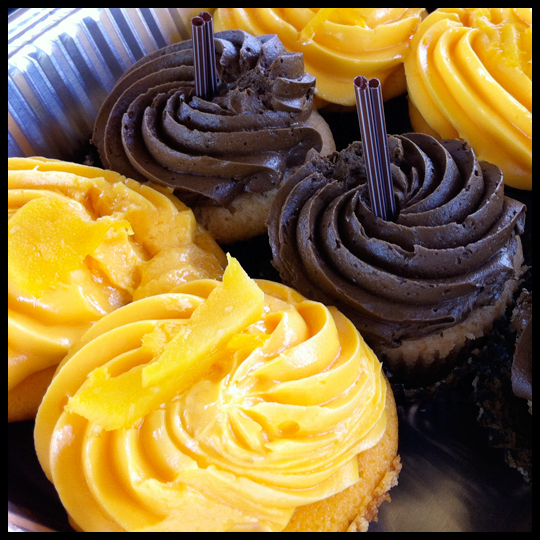 Danny McGibney: Sweet potato pie cupcakes with browned buttercream frosting. The 2012 CupcakeCamp DC raised $2,000 for DC Candlelighters and in the end we all had a really great time, Stacy and Elisa as guests and myself as a judge. I met some great people and I’m looking forward to seeing what next year brings, but I think I’ll just enjoy the event as a spectator or volunteer. 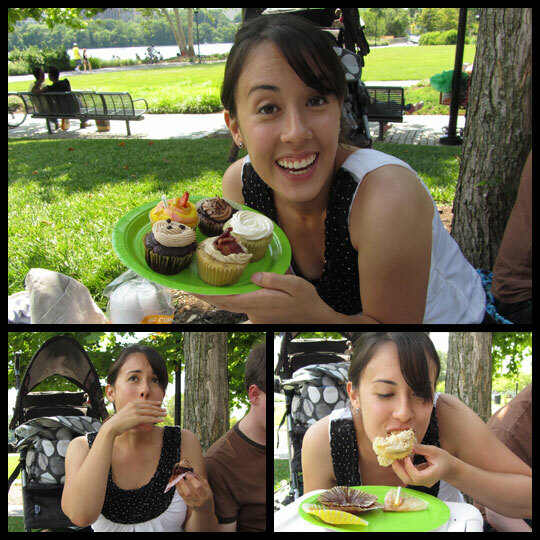 Twenty-five cupcakes were A LOT to taste! To see more event more photos, visit CupcakeCamp’s DC Flikr pool.